I wrote a ridiculously thorough campaign tagging guide, followed by a companion channels guide. Why? 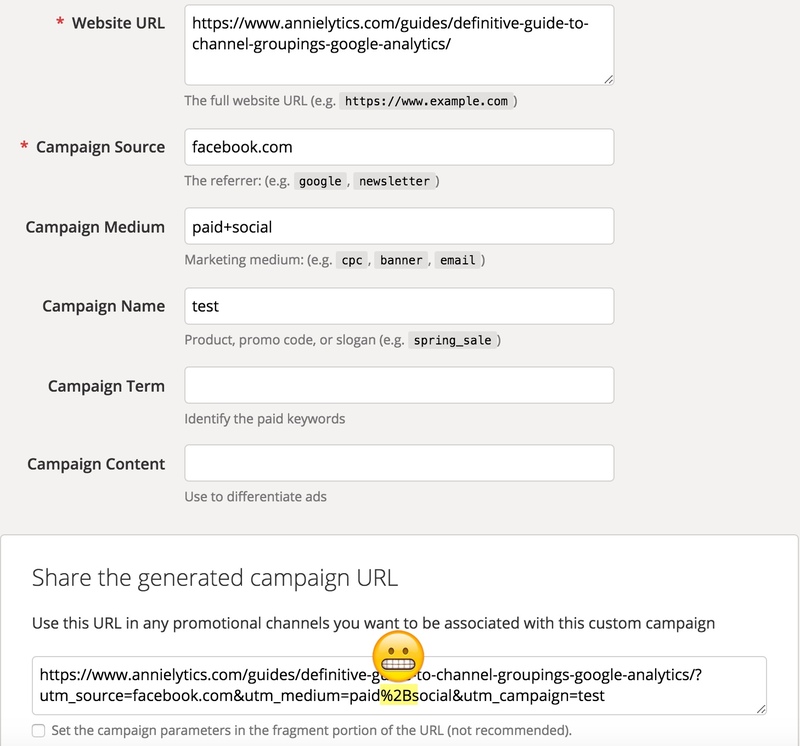 Because campaign tagging and broken (or under-optimized) channels are a couple of the biggest culprits in the glut of really bad data I see when I do analytics audits. So in this post I’m going to dive deeper into how to customize your Google Analytics channels — and why it’s so important. Google has a resource on its site that is pure gold. It’s covered with dust and possibly some trace DNA, so we’re going to shine it up a bit so that you can benefit from its usefulness in helping you figure out your channel strategy. You can find it here. But I’m also dropping a screenshot of it below with some annotations, so I can point out some gotchas and what I believe are outright errors. 1. Google engineers have identified about 400 sites that they deemed to be social sources. Since they’re not published anywhere, I went through all my client sites to identify as many of these as possible. I found 276 of them, most of which are pretty obscure. You can see them here. 2. These are the mediums you can use when tagging social campaigns. I always use ‘social’ since it’s the easiest to remember. If you don’t want to use one of these, you’ll need to customize your Social channel definition to accommodate your medium. You do that by going to Admin (the gear icon at the bottom-left corner of the interface) > View Settings > Channel Settings > Channel Grouping > Default Channel Grouping > pencil icon next to channel you want to customize > select the ‘or’ operator (there are a few use cases for using ‘and’, but they’re much rarer than the use cases for ‘or’ ) > select ‘Medium’ from first drop-down > select ‘matches regex’ from the second > enter the medium you use. 3. Grr. This definition has caused the most collateral damage I’ve seen to date, followed closely by social. If your site has any history of using capital letters, you should go into each of these channels and, at minimum, add the medium to your channel definition, set to ‘matches regex’, to ensure the match isn’t case sensitive. Example below. 4. Googlers came really close on this one. My main complaint is they didn’t account for the possibility of marketers using the plural version of ‘affiliate’. 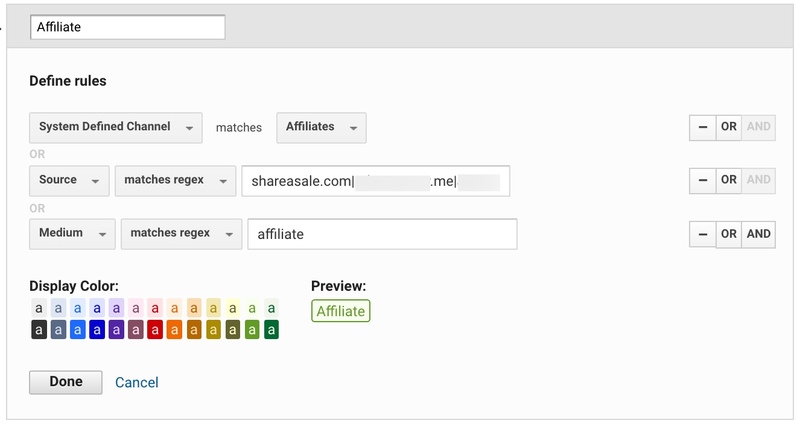 Ironically, I’ve never seen ‘affiliate’ used, only the plural version. Again, if engineers had used regex match instead of exact, the plural form would have been swept up as well. If you have a list of your affiliate sites, you should also include them, separated by a pipe character (the ‘or’ character in regex). If you hit the limit in allowable regex characters, you’ll need to select the ‘OR’ button and rinse/repeat in the Affiliate channel settings card. 5. 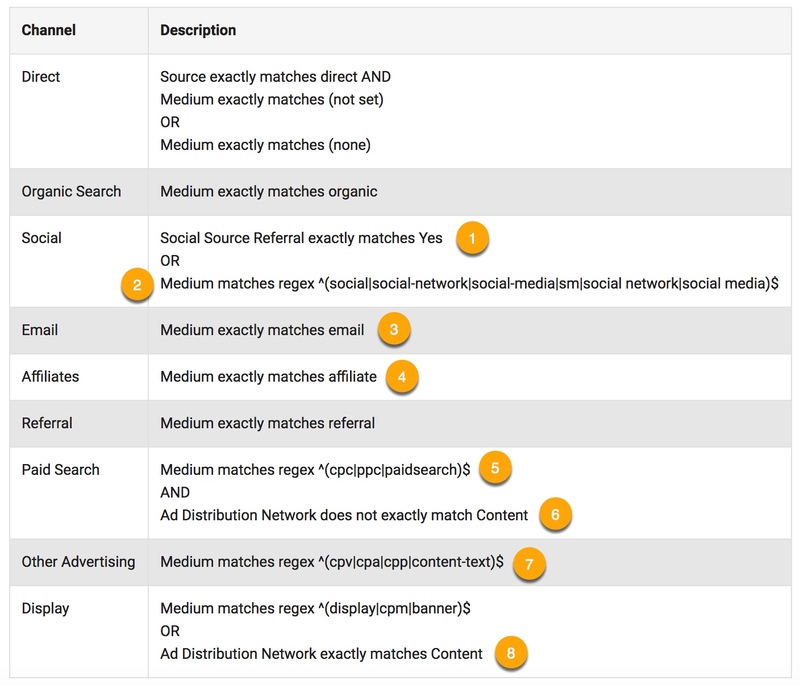 A common mistake I see in audits is using ‘cpc’ for tagging on social ads. Don’t. Do. That. If you do, your paid social traffic will show up in your Paid Search channel. Visitors who come from social sites behave very differently than those who come from paid search ads (e.g., AdWords, Bing Ads). But even if they didn’t, social sites != search engines. So do not use ‘cpc’ for paid social under any circumstance. Every time I say this some dudes try to mansplain to me why it’s actually okay and why they do it. Just don’t. (Mansplain or use ‘cpc’ for paid social. 😂) I provide specific recommendations on how to tag social ads. 6. If the Ad Distribution Network matches Content, it’s a display ad (the ads you see all over publisher sites, for example). You don’t want this traffic to show up in your Paid Search channel, so this is good. I only point this out to set up my next point. 7. First of all, I’m not a fan of using the word ‘other’ in classifying anything. It’s like a junk drawer. And data isn’t junk. (Well, unless you’re this site, but that got resolved. With fire.) If you’re dropping cash for ads, you want to be as specific as possible with your channel name. 8. When I worked for a publishing company, we brokered our own banner ad deals on sites with similar content, and an executive decision was made to tease that traffic out from our display traffic that we got from AdWords’ Content Network. If you wanted to do something like this, you could create a separate Banner channel that just matches on medium = banner and place it above the Display channel (since channels are processed in the order in which they appear in your Default Channel Grouping settings page) or remove ‘banner’ from your Display channel definition and use it in your Banner channel definition. We did this because these privately negotiated deals were important to us. We put a lot of research into choosing these sites, so we wanted to easily compare traffic and conversions from our Banner channel alongside our other channels easily. 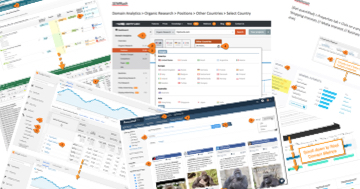 We could have kept them in the Display channel and segmented them from our other AdSense traffic using other parameters, but then it would have been harder to compare our banner performance to the other channels. That’s what I use as the litmus test to decide if a medium should be given its own channel. There are some important channels that are not included in Google’s default channels list. You can find them in the Good Channels to Consider of my channels guide. The Paid Social and Retargeting channels are, imo, absolutely imperative if you engage in these types of campaigns. Many clients classify retargeting (also called remarketing) traffic as display because technically these are display ads. But display campaigns are typically pray and spray, whereas retargeted traffic is highly … well … targeted (if done well). And I always want to compare this traffic to my other channels, so it’s a no brainer to give it its own channel. Ymmv. Basically, if you spend a lot of time and resources on a venture, YOU SHOULD TAG IT. It’s like putting a ring on it. I’ll share a few from my site. Hundreds of Tools for Marketers: This is a list of nearly 400+ tasks marketers frequently need to perform and tools they can use to perform them. It also lets you know if said tool is free, paid, or freemium and sometimes even includes special instructions. Campaign Tagging Tool: This spreadsheet automatically tags links for you using Google Sheets formulas. It also gives you some tips and guidance to walk you through the tagging process to, you know, keep you on the straight and narrow. It’s a good tool to use over Google’s Campaign URL Builder if you want to reuse links. I used to just link back to my site from these spreadsheets, but then it just shows up in my Referrals report as ‘google.com’. (Organic traffic shows up as coming from ‘google’; referral traffic as ‘google.com’, btw.) However, ‘google.com’ includes all of Google’s properties, so it’s pretty useless. Ergo, I added campaign tags to these links back to my site and set the medium to ‘gdoc’. And then I created a customized channel to capture this traffic. 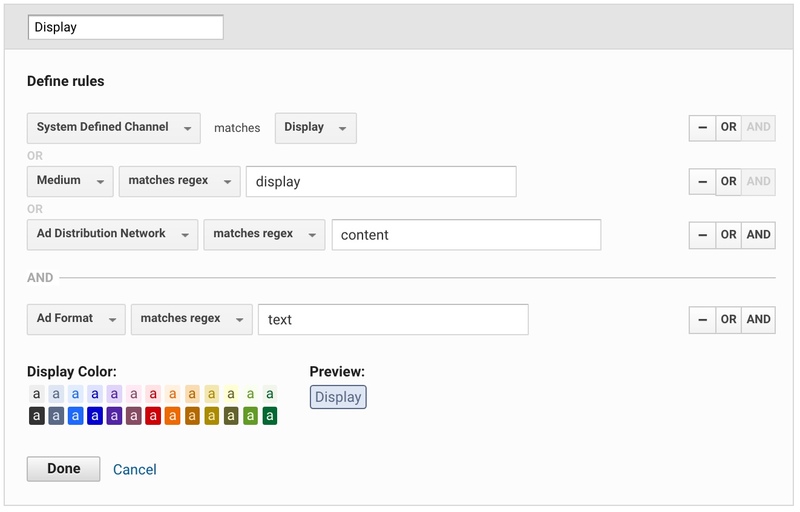 Again, make sure you add your custom channels to the top of the channels stack. If I had my Google Docs channel listed below my Referral channel, no traffic would show up in my custom channel. That’s because ‘google.com’ is identified as a referral, so it would still drop into that channel. And if you’re a publisher with syndication agreement with larger publishers (so that they can republish your posts), you would want to make sure your Partner channel (or whatever you called it) was positioned above your Referral channel. Pro Tip: If you use my campaign tagging tool or most other tools, adding a plus sign between words will translate into a space in your Google Analytics reports. However, if you use Google’s Campaign URL Builder, don’t include them. Google’s tool encodes all special characters included in your tags, and they will actually show up in your reports as plus signs instead of spaces. You can see in the animated gif below how I tested this to demonstrate the issue. Note: I selected ‘Philadelphia’ to isolate my session because that’s where I live. You can learn more about how to use Google Analytics’ real-time reports for testing because, of course, I wrote a post on it, as I am wont to do. And this is how I configured my Paid Social channel. Note: I didn’t include the plus sign in my definition. I want to match how it actually appears in Google Analytics, not how I tagged it. Also, you want your custom channel names to match the format of the Default Channel Grouping, so I use initial caps. It drives me insane when I see channel names in all caps or lowercase in a client’s Channels report. It looks so bush league. I create a number of downloadable resources for marketers, such as my Annielytics DIY Site Audit Template, Analytics Audit Template, and Marketing Strategy Guide. These are Word documents that marketers can download and use to perform audits and competitive analyses. 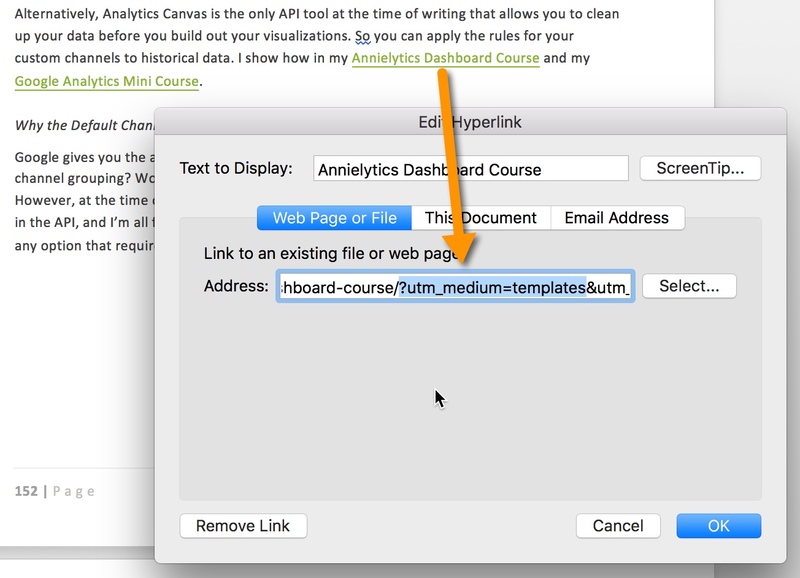 But links in documents — whether it’s a Word, PDF, PowerPoint file, etc. — don’t send any referral data when a user clicks through to a site, so this valuable traffic shows up in analytics reports as direct. For this reason I highly recommend adding campaign tags to these links. For my templates, I set the medium to ‘templates’, as you can see in the screenshot below. With this channel set up, I can see that my templates have generated additional income for my site. And when I look at my Multi-Channel Funnels Assisted Conversions report (what are Multi-Channel Funnels reports? ), you can see that they have played an additional role in assisting in conversions. You go, little up-selling templates! Note: You may be wondering why the the revenue in the Last Click column doesn’t match the revenue from my Channels report (which is also ostensibly last click). I answer that question in the MCF post I linked to in the previous paragraph. I may have taken some artistic license in exposing how Google shook down the direct channel and embezzled the credit due it, sure, but the rest of the post is totally legit. I have more examples of other custom channels I’ve created for my site, but this post is already pretty long. So I’ll close up with that. 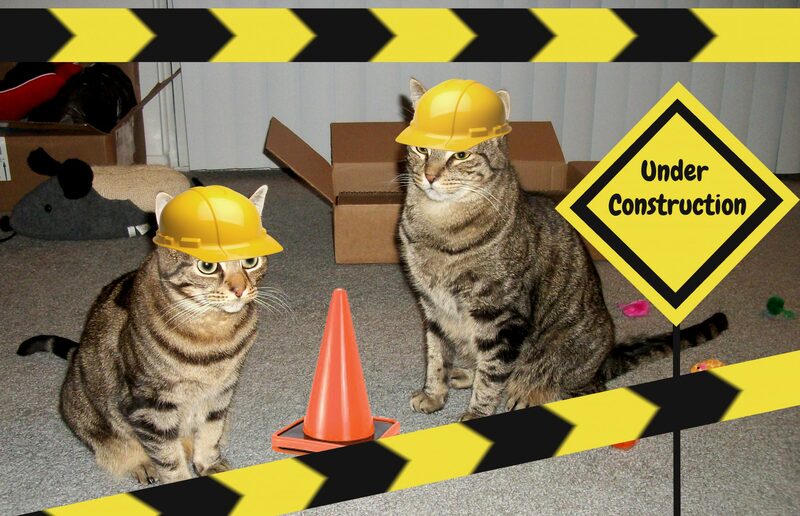 No but seriously … Hopefully this post will embolden you to create custom channels. If you get into the process and need some help or someone to check your work, you can always buy a hangout, where we can share a screen and walk through the process together. An issue I see repeatedly is facebook being incorrectly assigned since it appears as (source) Facebook, m.facebook,.com l.facebopok.com, facebook.com, lm.facebook, Facebook.com etc which are all different but refer to the same thing. Absolutely! I addressed the best dimension to get around this in this post: https://www.annielytics.com/blog/analytics/social-network-dimension-unsung-hero/. Thanks for jumping in, Brad. My one caution with that approach is you won’t be able to differentiate between the different Facebook subdomains. For ex, seeing that Facebook’s mobile subdomain is sending traffic to the desktop version of your site (which I demonstrate how to find in this gif: https://www.screencast.com/t/TnmuTUw8) can be valuable to research as to why. I’m also not a fan of removing the tld when manually setting the source (e.g., facebook as opposed to facebook.com or pinterest as opposed to pinterest.com). BUT if you don’t care about that kind of thing, these are good filters. Just add the ‘.com’ at the end. Thank you for the note Annie, both are valid points! Great stuff Annie! Love the event builder sheet, I passed along to my team. Thank you! Thanks for some great articles – this was exactly what I was looking for. Yay! Glad I could help in some small way! Cool idea! I just wasn’t clear on how to use it. Maybe provide more of a guided approach? I will do a quick video and send it over. Stay tuned! You don’t need to do that for me. I’m not your target audience. I was just suggesting that you might want to add annotations within the tool to guide people in how to use it. Great article. Thanks for the tip about the paid social and retargeting channels, missed that one!